All 4 Javelin Abilities - anthemapps Webseite! 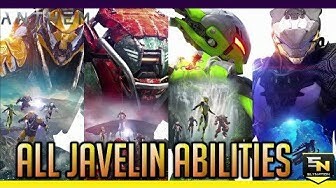 In this video, we take a deep dive into all 4 Javelin's and check out EVERY ability we know of so far. Each Exosuit has 2 intrinsic abilities, 3 core ability slots (5 choices per slot), and an ultimate. Hopefully, this gives you a better understanding of which Javelin you want to check out on day 1!